You have been redirected to our mobile site. Germany's environment minister recently visited the Asse mine, where 126,000 barrels of radioactive material are stored. Frustrated locals want the waste disposed of elsewhere — a project that will span decades. Manfred Kramer is not exactly happy about Environment Minister Svenja Schulze's visit to the Asse mine in the northern state of Lower Saxony. The 67-year-old is a member of Schulze's party, the Social Democrats (SPD). Where to store nuclear waste for good? The reason for his frustration? Kramer does not live not far from the former Asse salt mine that has long been used as a deep storage facility for nuclear waste. And here he is now, too, in front of the factory gate. For years Kramer has been speaking out against the continuing storage of low to medium-level radioactive waste in the old mine. It was deposited more or less carelessly in the old mine in the 1960s and 1970s. Waste from nuclear reactors make up the largest part, but it also contains waste from hospitals and research institutes. It is not clear whether some of the waste there is highly radiocative. There's no evidence to that effect, but plenty of rumors. "It's nice that she's finally coming," Kramer quips to the journalists who have accompanied the environment minister on her trip. "Soon she'll have been in office for a year. It sure took a while!" Until now, no environment minister has been able to score points with locals on the issue of the "Asse"— how the mine is commonly referred to in the area. The local sentiment of resentment towards politicians speaks to the fact that for years the Asse has become a symbol of neglect, shown by state, business, and research sectors in terms of the legacy from nuclear energy. Germany’s anti nuclear movement got its start in the early 1970s, when protestors came out in force against plans for a nuclear power plant at Wyhl, close to the French border. Police were accused of using unnecessary force against the peaceful demonstrations. But the activists ultimately won, and plans for the Wyhl power station were scrapped in 1975. Following the success of civil disobedience in Wyhl, similar protests were held in Brokdorf and Kalkar in the late 70s. Though they failed to prevent reactors being built, they proved that the anti-nuclear movement was a growing force. 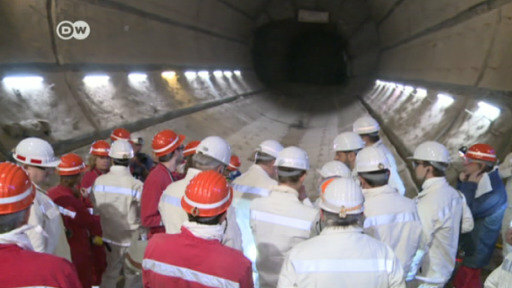 Gorleben has seen fierce protest against the nuclear industry ever since plans to store nuclear waste in a disused salt mine there were first announced in 1977. The site is a sparsely populated area close to the then-border with East Germany. Yet locals quickly showed they weren't going to accept radioactive material close to their homes without a fight. From the beginning, the German anti-nuclear movement brought together church organizations, farmers and concerned local residents - along with student activists, academics, and peace protestors who saw a link between nuclear power and the atom bomb. Being at the frontline of the Cold War meant the threat of nuclear war loomed large in many German minds. In the late 70s, anti-nuclear activists joined with other environment and social justice campaigners to form the Green Party. Today, this is a major force in German politics and probably the most powerful Green Party in the world. They won their first seats in the German federal parliament in 1983. In 1986, a reactor meltdown hundreds of miles away in Ukraine hardened public opinion against nuclear power in Germany. The Chernobyl disaster released radioactive fallout across Europe. In Germany, people were warned not to drink milk, eat fresh meat or let children play on playgrounds, where the sand might have been contaminated. In 1998, the Green Party came into German federal government, as the junior partner in a coalition with the Social Democrats. In 2002, the "red-green" government passed a law banning new nuclear power plants and limiting the lives of existing plants so that the last would be switched off in 2022. Even with an end to nuclear power finally in sight, the anti-nuclear movement still had plenty to protest about. Many activists, including in the Green Party (with leaders Jürgen Tritten and Claudia Roth pictured above in Berlin in 2009) wanted nuclear power phased out far faster. Meanwhile, the German movement continued to join international calls for a global end to nuclear power. Then there was still the question of what to do with nuclear waste. By 1995, containers of radioactive material were coming back from reprocessing abroad for storage at Gorleben. Over the years, transport of these "castors" has regularly been met with mass protests, including clashes with police. Angela Merkel's Christian Democratic Party had always opposed the law limiting the life of Germany's nuclear power plants - so after the party came to power in 2009, it effectively scrapped it by prolonging the lives of power plants - a major setback for the anti-nuclear movement. In 201,1 the meltdown of a Japanese nuclear reactor saw Merkel's government make a rapid about-face. Within days of the Fukushima disaster, it passed a law to shut down the last of Germany's nuclear power plants by 2022. The phase-out was back on, and eight reactors were shut down that same year. Since the grassroots action of the 70s, Germany's anti-nuclear movement has seen the country commit to ditching nuclear altogether. It's also helped push forward a shift to renewables, making Germany an international example in the fight against climate change. But the protests go on. This week, activists stopped the first boat carrying nuclear waste. In 1965, the extraction of potash salt in the Asse stopped. After it was shut down, the nuclear waste was officially put there for "research purposes" until the end of the 1970s. But in reality, the mine was a repository. And the facility has been dilapidated for a long time now; water flows into the tunnels, some 13,000 liters — every day. "Three generations operated nuclear power in Germany, and now 30 generations or even more will have to suffer the consequences," Schulze complains. "This is proof of how irresponsible nuclear energy was," she adds. In 2010, it was decided that the barrels must be retrieved from the mine — and nobody wants to risk the complete collapse of the shafts which means the waste could come into contact with groundwater. It is a billion-dollar project. However, many experts doubt whether retrieving the barrels from the old shafts can be carried out successfully at all. Germany's federal company for radioactive waste disposal (BGE), was founded in 2016 and is responsible for the mine and the waste retrieval. One of their experts is the mining engineer Thomas Lautsch. Living Planet: Nuclear power – what future? Lautsch takes the environment minister through the mine, 490 meters (around 536 yards) below the surface. Listening to the engineer talk, one begins to grasp just how complicated the retrieval could get — and how expensive: "We would have to build a retrieval mine, which is more than simply just a new shaft. We would also need an interim storage facility for the waste, and we would have to create many new shafts to gain access to the individual chambers." Lautsch adds that the construction phase for this will easily take eight or nine years. "By about 2024, we have to start construction". The old shafts and the horizontal paths in the mountain do not meet the current legal standards on nuclear material. This means that a completely new mine will have to be built around the old mine, simply to retrieve the barrels. If everything went according to plan, the retrieval could begin in 2033. Schulze concedes that this timeline is much too long. But she emphasizes that planned retrieval of the barrels of waste from the ailing facility must be a combination of both safety and speed. "Safety must be the absolute priority," she stresses. In other words, this could still take a very, very long time. "The barrels must be finally and safely disposed of somewhere else in the country," demands Kramer, "should they actually able to be retrieved by 2050." The local SPD party member argues that the residents of the region have already experienced enough fear and unease due to waste being stored at the aging site. It will be over the course of the next few years that will show whether or not a safe and successful extraction is possible. All those involved are still hoping for the best. Nuclear waste: Where to store it for eternity?